Wabash men are expected to live humanely. In fulfilling that objective, five alumni spent last Oct. 6 making sure a YMCA nature trail at Fishers, Indiana, was safe for children who would be visiting it later in the fall. The project was part of Wabash Day, a volunteer service weekend organized and executed by groups of Wabash alumni across the country. Dozens of alumni groups coordinated with organizations in their areas to work on service projects this past weekend to mark the third annual community service weekend. See Fishers Photo Album here. Group leader Seamus Boyce ’03 and four other alumni gathered together on a warm Saturday morning resembling midsummer more than early fall to help out at Camp Mudsock, part of Fishers’ YMCA. The alumni relined the trail with wood rails and re-mulched the trails with organic material donated by Duke Energy. According to Senior Youth and Family Director Jennie Smith, the YMCA does not turn people away for not being able to pay to use its facilities. Instead, scholarships are given out to those who cannot afford the rates. The organization hopes to raise $249,000 this year, but over the past year has given out $300,000 to $400,000 in scholarships. This emphasizes how much the organization depends on its volunteers. "During the summer we have about 800 day campers, 400 on-site, and 180 that will be using the woods on a daily basis," said Jennie Smith, Senior Youth and Family Director. 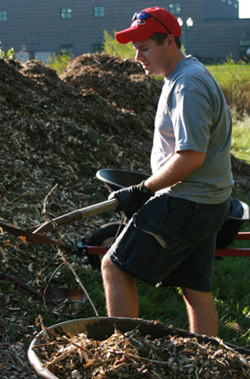 "We’re re-mulching the trials because we have a Halloween Extravaganza at the end of this month. We’ll have about 300 to 400 people walking through our woods, and we need the trial realigned and re-mulched so it’s safe and so everyone can see their way through. We rely on volunteer groups to help us with the mulching of the woods. We just don’t have the staff to do that twice a year. So we really rely on United Way and the volunteers that they bring to us to help us out with that." 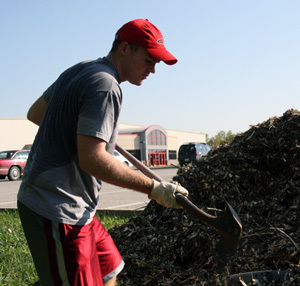 The alumni arrived at the camp entrance around 9:00 AM: four mounds of mulch, shovels, wheelbarrows, and pitchforks were all there ready to be used. Smith was there to meet them as well. She gave them a tour of their work area, and the alumni quickly organized themselves into a system of loaders, movers, and spreaders. Boyce, Mac McLaughlin ’83, and Mark Sutton ’68 drove wheelbarrows back and forth from the mounds to different parts of the winding trail to be dumped and spread by Brent Sutton ’62, Mark’s brother, and Erin Boyce, Seamus’ wife. Jason Hopper ’03 began his day by re-lining the trail with the large logs that had been knocked off the course and, when he had finished, took up a fourth wheelbarrow. By lunch, the group had relined and mulched half of the trail. "I think it’s an excellent opportunity for Wabash alums to participate in communities across the state to really better that community in some fashion," said Mac McLaughlin, Carmel. "In this particular project, I think it’s good because there’s been some work that’s needed to be done for a long time, and it gives us a chance to really feel like we’re having an impact. I think community service is a great thing for any college alumni group to do, and I’m glad we’ve taken this on as a passion." "I think it’s a great idea that Wabash organizes some type of volunteer effort to help out communities," said Mark Sutton, Carmel. "That’s great. This is just a magnificent facility. I was a little surprised we were helping out in Fishers. I didn’t know what the situation was. I thought we might be more of an inner-city project, but obviously they’ve got work to do. And we’ll make some headway on it. We could use an army of people given the stack of mulch here and the length of the trail. But we’re glad to be doing our part." "I think it’s a good opportunity for Wabash to get its hands out in communities," said Jason Hopper, Fishers. "And its something that I feel like Wabash establishes at a pretty young age to freshman having their community service day. Just to have alumni come and continue that spirit of community helpfulness I think it’s definitely a positive thing. It does nothing but give back positive, good will towards the college." "It’s a terrific opportunity to get out here and find out what we can do to be helpful," said Brent Sutton, Carmel. "We appreciated getting the tour here. This is going to be a fun day. I don’t know if they do any running along this trail, but anyway it’s a beautiful route and an easily defined objective. We have plenty of work ahead." "When I was a student at Wabash I did a lot of service projects for my fraternity, Sigma Chi," said Group Leader Seamus Boyce, Fishers. "One of the traits of being a Wabash alum is living humanely, so I think this is a pretty cool aspect of the Wabash Day event, considering everyone’s having these projects across the country." In Photos: Upper left, Jason hopper '03 gives a hand. Lower right, Seamus Boyce '03 helped organize the Wabash Day effort.